Trailhead and parking area are located on Rt. 11 in Alton, NH, 5.4 miles north of Rt. 140. Mt. Major is always cited as "The" hike of the entire Lake Region, and this means it is usually mobbed with hundreds of people on the weekends. While Mt. Major is undoubtedly a wonderful peak with a panoramic lake view, there are plenty of other fine places to explore in the Belknap Range. Described here is a nice loop hike that visits Mt. Major and takes hikers on a tour of the variety of terrain around it, visiting other scenic vistas, wild forests, and marshes that are free from the popularity and massive crowds of Mt. Major. Notice that since you will visit Major itself along the loop, you should still avoid this one on weekends and holidays. You will be starting on the Mt. Major Trail, the most popular route to Mt. Major. It begins in the northwest corner of the parking area; it is to the right of Boulder Loop Trail. The trail starts as a wide dirt path running along the base of the mountain. It begins climbing initially, but flattens out after awhile, reaching a junction in 0.7 miles. Continue straight here on the old road, curving around to the north side of the mountain. This is Brook Trail, a less-used route to Mt. Major. Half a mile beyond the junction, Brook Trail crosses its brook, a branch of Minge Brook, then crosses it again in 0.2 miles. It ascends moderately up the wide path with loose footing, and in another 0.2 miles, reaches a junction. Turn right onto North Straightback Link and off the beaten path, since most hikers going this way will be staying left toward Mt. Major. This path may be difficult to follow due to its low usage. The trail immediately drops to cross the brook, then heads up moderately through the open forest, following a minor ridge of Straightback Mountain. Look for the bright green blazes as you make your way along the obscure path. After 0.4 miles, the trail flattens out, crosses a muddy section, then attacks the final short, rocky pitch to the summit of Straightback Mountain. At the summit, you find yourself in a pretty forest glade at a trail junction. There are no views here, but at Straightback's south peak, visited later in the loop, you will find wide views. Note: for a shorter loop that cuts out Quarry Mountain, stay left onto Quarry Trail and use it to connect directly to the south summit of Straightback. For the main loop which tours additional scenic forests, minor viewpoints, and a pretty marsh, turn right on the Quarry Trail as it abruptly descends a very steep pitch down to a grassy and sometimes wet low point. It then gradually ascends East Quarry, reaching a ledgy area in 0.4 miles (from Straightback). It runs across the ledges, passing by a couple good viewpoints out over Lake Winnipesaukee. Beneath one of the viewpoints is a moderate-sized rockfall. From this one, you can see further to the east, to the Moose Mountains and nearby Mt. Major. In the next 0.2 miles, the trail swings to the west and ascends gradually through the forest to a small cliff, where you must scramble up halfway, then turn and walk to the left all the way up and around the top half. After this, the trail skirts the edge of a logged area, then attains the minor summit of East Quarry. From here, the trail quickly descends to a low point, where an old road comes in from the Quarry Mountain Forest on the right. The trail hops up over a knoll; then, 0.2 miles from the East Quarry summit, the trail enters an clearing, where limited views can be obtained by walking out to the right. In the next 0.3 miles, the trail descends for a bit, then crosses the mostly long, flat gap between the two peaks of Quarry Mountain. Swinging left, it begins a moderate and short climb to West Quarry, passing by a very limited viewpoint over a pond in between Quarry and Straightback. The trail then reaches the summit of Quarry, where Marsh Crossing Trail takes off downhill to the left. You will use this trail to continue the loop toward South Straightback. For now, continue a short distance past the summit on the Quarry Trail to find a minor viewpoint of the neighboring Belknap peaks to the west: Mts. Mack, Klem, and Rand. Follow the Marsh Crossing Trail (0.4 miles total) as it descends to the south from Quarry Mountain over forested ledges. The trail travels through the beautiful open forest to a small marsh in the center of a sizable chain of swampy waterbodies in this small corner of the Belknap Range. It then heads to intersect the Belknap Range Trail to the east of Mt. Anna. Turn left and enjoy the next quarter mile through flat, wide open forests before it makes a sharp 100-foot climb past a small set of cliffs, then across a flatter area to a wide open ledge area on the broad crest of South Straightback Mountain in another quarter mile. Here, there is a four-way junction marked with rocks and paint, where Quarry Trail turns left, and Precipice Trail goes right. Continue straight, enjoying some views to the south, for 0.1 miles to the summit of South Straightback. At a trail sign, the Belknap Range Trail diverges to the left, while Straightback Mountain Trail continues straight. Remember the BRT for the next segment of the loop, and continue straight to acquaint yourself with the miscellaneous views from the huge, flat, and rocky area at the top of the present peak. Exploration of the next 0.2 miles of this trail will find you many lovely viewpoints of the surrounding hills and ponds to the south and distant peaks in southern NH. One excellent wide ledge at the far end of the summit provides a sweeping view to the east. To continue to Mt. Major, take the Belknap Range Trail from the summit junction. It descends off the ledges at the summit and continues down through the forest for 0.3 miles to a junction with Quarry Spur on the left, just after some small forested ledges. Continue on the BRT for the next 0.3 miles, crossing another minor ledge and descending quickly to a junction with Brook Trail, one of the first paths you followed in this loop. Continue straight as the BRT and Brook Trail join and ascend to Mt. Major, soon emerging on scenic open ledges, which make up most of this short ascent. In 0.2 miles, pass the junction with Jesus Valley-Beaver Pond Trail on the right and continue for 0.3 miles more to the summit of Mt. Major and its panoramic views. 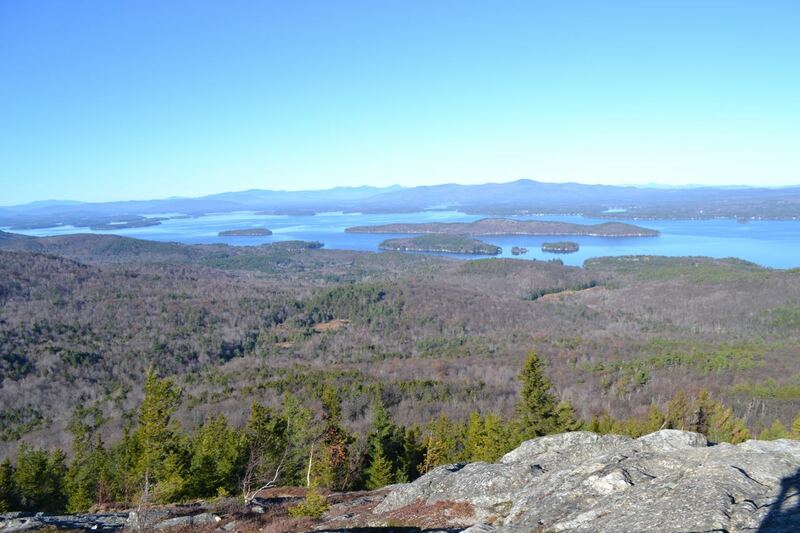 From the summit, there are very wide and close-up views of Lake Winnipesaukee. To the east are Copple Crown Mountain and the Moose Mountains. To the north is the circular Ossipee Range. The Sandwich Range of the White Mountains is a prominent feature across the lake to the left of the Ossipees. The smaller Squam Range also occupies a portion of the scene further to the left. To the west, the distant view is blocked by nearby Straightback Mountain and Quarry Mountain, the terrain you have traversed in this loop. Belknap Mountain, the highpoint of the range, pokes out between these two. The area around the summit itself is fairly large and provides many places to sit and enjoy the view; one spot on the southeast side provides a particularly nice view of Alton Bay. The remains of an old fire lookout stands at the highest point. To descend from Mt. Major and complete the loop, find the top of the Boulder Loop Trail, to the south of the Mt. Major Trail. Follow this trail across the southern ledges and past a small bog before entering the forest. For the first 0.4 miles from the summit, the trail descends at a pleasant grade, crossing more ledges in the forest. After this section, the trail makes a zig-zag, then drops over a very steep and rocky pitch toward the namesake of the trail, an extensive area of the forest with scattered boulders. After 0.2 miles, the steepest part is over, as the trail weaves through boulders and over large, flat rocks. In another 0.3 miles, the descent is mostly over as the trail swings left to join a woods road. In 0.3 more miles, it makes a right turn downhill, then turns left as the trail junctions with the other end of Jesus Valley-Beaver Pond Trail. From here, the woods road continues 0.4 miles to the parking area.